Sirbed: Aural Inversions of Debris:: April 22, 2010; 6:30 – 8:30 p.m. :: P.P.O.W Gallery, 511 West 25th Street Room 301, New York, NY. This one-night exhibition presents three newly commissioned experimental sound compositions by artists from across the country. The two-hour exhibition, occurring two days before the closing of P.P.O.W’s concurrent three artist show Debris, seeks to invert the ways that the viewer traditionally perceives an exhibition through positing sonic manipulations of its visual, written, and social material. The three new works will be presented to viewers in the darkened gallery-turned-theater, synthesized under the dislocating darkness, an additional empirical inversion and mediator between the visual gallery experience and the reconfiguration of this experience through sound. For Sirbed, San Francisco-based experimental electronic musician Thomas Dimuzio creates a soundscape produced from the exhibition Debris’ visual information. 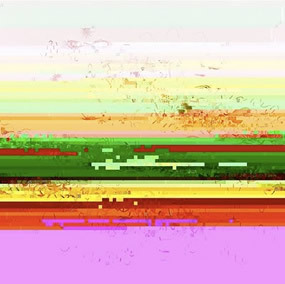 Utilizing downloaded JPEGs of the works on display in the gallery, Dimuzio electronically translates image to sound and then further contorts and expands this information into a re-contextualizing noise composition. Chicago-based Artist Brett Ian Balogh employs the written exhibition material, specifically the press release, to generate his sonic arrangement. The text will serve as the basis for a code, or set of instructions, that then becomes the raw material for a radio collage, subsequently recorded by Balogh and presented in the gallery. Sound artist and New York-based performer Jonny Farrow samples the social interactions occurring in response to the exhibition Debris. Utilizing field recordings gathered at the opening reception, the cacophony of verbal exchanges and physical motion in the gallery become the source for his composition. * the three sound works will be played in succession twice. While being played, gallery doors will close for approximately 30 minutes.